Femme isn't necessarily a word I associate with–unless it's femme fatale. But when it comes to my work wardrobe, I've noticed that I feel my most confident when my outfit features a mixture of feminine and masculine silhouettes, and offbeat accessories. I recently added the Flounce Skirt from Paris Sunday to my work wardrobe and it's quickly becoming a favourite for Monday to Friday. Paired alongside the masculine silhouette of my blouse and fishnet socks, this skirt looks far from girly. Paris Sunday is a Private Label created by Amazon featuring stylish pieces for the office and beyond. 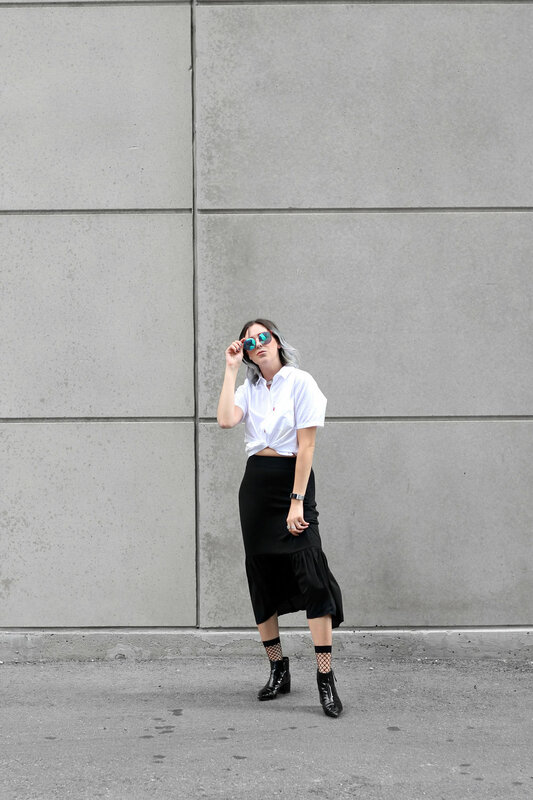 I personally find that their aesthetic coincides best with my work wear, although there are definitely a few pieces, including the Flounce Skirt, that I would happily style for an after-work function! Shown Wearing // Crop Blouse, Levi's (similar here); Flounce Skirt, Paris Sunday; Socks, Missguided (similar here); Patent Leather Booties, Nine West (similar here); Fit Bit Band, Amazon. If you haven't have a chance to check out the Paris Sunday collection on Amazon.ca yet, you definitely should! Especially if you're looking for pieces that are easy-to-wear for work! Shope the collection here! What would you pair with this skirt? [*]AS AN AMAZON.CA ASSOCIATE, THIS POST HAS EEN SPONSORED BY AMAZON.CA, HOWEVER ALL VIEWS EXPRESSED REFLECT MY OWN OPINION ON THE PRODUCT/SERVICE. FOR ADDITIONAL INFORMATION PLEASE SEE THE DISCLAIMER FOUND IN THE ABOUT ME SECTION.